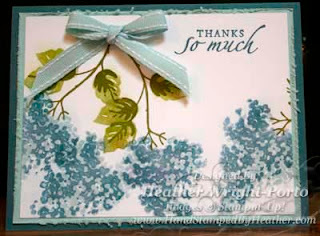 I made this a Thank You card, however blues are great for Sympathy and Get Well Soon cards as well! This card and set are very versatile. Here are similar cards in peach tones and purple tones (http://heatherporto.blogspot.com/search/label/STAMPSET-Blossoms%20Around). Stamp the vines in Old Olive. Stamp petals in Versa Mark, stamp the petals where desired, then use the Sponge Dauber in Old Olive pastel and dab where you stamped the Versa Mark. Stamp the 1st step of the flower in Sky Blue. Stamp the 2nd step of the flower (the accents) in Versa Mark and stamp over all the previous Sky Blue flowers. Then use a Sponge Dauber in Not Quite Navy pastel and dab where you just stamped the Versa Mark. Use Distressor Tool (part of Cutter's Kit) to rough the edges of the Sky Blue panel/cardstock. Stamp greeting in Blue Bayou. Create a bow with Sky Blue Double Stitched Ribbon and adhere to Whisper White card front with Mini Glue Dot. Adhere all panels with SNAIL adhesive. Instead of using Versa Mark and Stampin' Pastels, simply do 2-Step Stamping with ink. For the Old Olive petals, stamp in Old Olive ink, stamp "off" on scrap/grid paper, and then on the Whisper White cardstock. For the "dark blue" flower accents (instead of the Night of Navy pastels), stamp in Blue Bayou ink and then over the Sky Blue flowers.